The Lakers post season came to a grinding halt as the Oklahoma City Thunder won the series 4-1., winning the final game 106-90. Russell Westbrook top scored for the Thunder with 27 points, while Kevin Durant added 25 points and 10 rebounds. This is no doubt a big step forwards for the Thunder. They have achieved what they did last year, and now have the chance to take this franchise to the next level. It would be be a huge achievement for this team to make it to the Finals. However, they face a more than difficult challenge in the San Antonio Spurs, almost the opposite to who they are. It will be veterans against youth in a hugely exciting Western Conference Final. A certain Kobe Bryant did everything humanly possible to stave off elimination, scoring 42 points in his final playoff outing of the year. It took a monumental effort from Kobe Bryant but the Lakers handed the OKC their first loss of the post season with a 96-99 win at the Staples Center. Kobe had 36 points, 6 assists and 7 rebounds in one of him more complete performances of the playoffs. 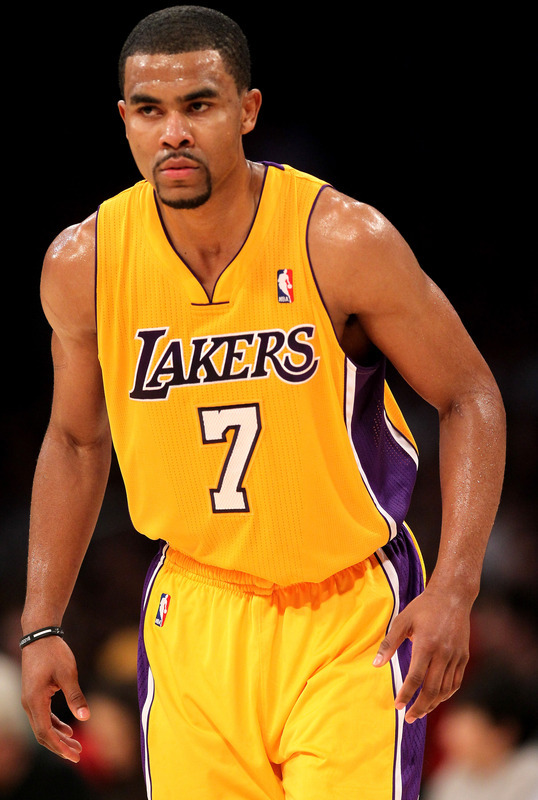 Andrew Bynum added 15 and 11 on a night where he saw limited touches. Kevin Durant led the way for the Thunder with 31 points while both James Harden and Russell Westbrook had 21 points apiece. Westbrook also handed out 9 assists. 20 points from both Kobe Bryant and Andrew Bynum were not enough for the Lakers to take down the Thunder in Game 2. The Thunder stormed to on a 9-0 run at the ennd of the game to steal the game from the Lakers. 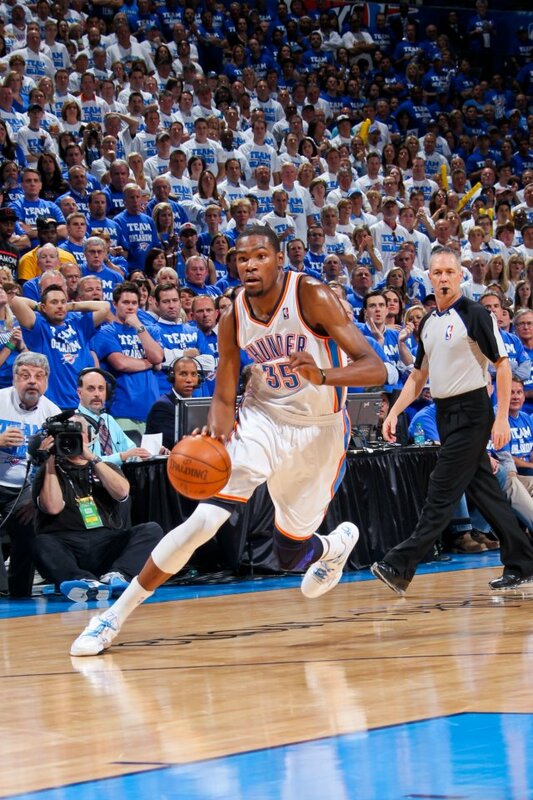 Durant led the way for the Thunder with 22 points including the game winner. James Harden added 15 off the bench in another consumate performance. This series is heading into dangerous territory now for the Lakers. Next game at Staples is critical if the Lakers are to gather any momentum in this series, it has to start next game. Anything later is too late. A couple of clutch triples from both Ramon Sessions and Steve Blake sealed the win for the Lakers as they took down the Nuggets at the Pepsi arena. 20 points from Danilo Gallinari was the only real standout for the Nuggets in the loss, with Andre Miller scoring 11 points in the opening minutes but going quiet for much of the rest of the game. Andrew Bynum continued to dominate the Nugget’s frontcourt with 19 points and 7 rebounds. Kobe Bryant flirted with a triple double all night with 22 points 8 rebounds and 6 assists. However perhaps the biggest reason for the Lakers win was the defence of Ramon Sessions on Ty Lawson, who tore through the Lakers last game. However, this time around, Lawson was held to just 11 points on 5-13 shooting. Now the Nuggets face the unenviable task of fighting for their playoffs lives in Staples. Despite Kevin Durant’s 44 points and Russell Westbrook near triple double game weren’t enough for the Oklahoma City Thunder as they went down to the Indiana Pacers. Roy Hibbert didn’t led Durant’s monster mash stop him from playing a big game as he put in 21 points. Danny Granger also had 26 points for the Pacers. Atawn Jamison had 25 points as the Cleveland Cavaliers defeated the Toronto Raptors by 4. The Cavs out scored the Raptors by 16 points in the final quarter to set up the win. Kyrie Irving was out for another game for the Cavaliers. Net’s point guard Deron Williams scored 19 points and handed out 13 assists as the New Jersey Nets defeated the Washington Wizards. John Wall had 18 points to lead the Wizards in the loss. 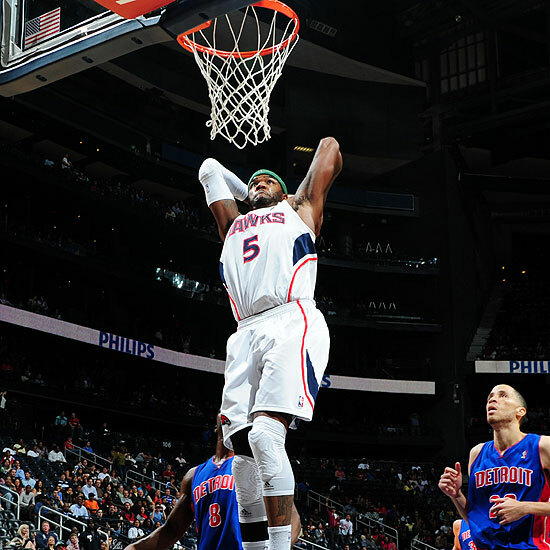 Josh Smith had 22 points, 12 rebounds and swatted 3 shots as the Atlanta Hawks defeated the Detroit Pistons 96-101. Rodney Stuckey once again lead the Pistons off the bench scoring 27 points to lead all comers. 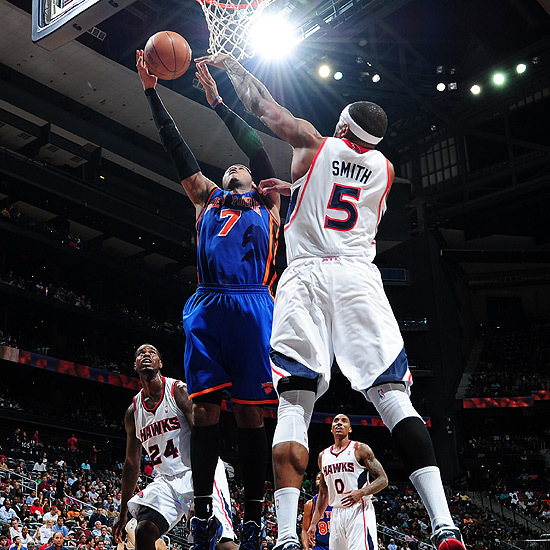 Jeff Teague had 24 points for the Hawks. The Miami Heat were not able to overcome a slow start as they lost to the Memphis Grizzlies by 15. Six players scored in double figures for the Grizzlies, including Gilbert Arenas who went 4-5 from behind the arc to have 12 points. LeBron James had 21 points to lead the Heat as the Grizzlies ended the Heat’s 17 home game run. LaMarcus Aldridge knocked down the game winner in overtime as the Portland Trailblazers stole a game from the Mavericks in Dallas. Raymond Felton had 30 points, 6 assists and 7 rebounds to lead both teams. Dirk Nowitzki had 23 points and 14 rebounds in the heatbreaking loss. 5 players scored in double figures off the bench and Tim Duncan had 19 points as the San Antonio Spurs took the top of the Western Conference with a big win against the New Orleans Hornets. Eric Gordon was the only Hornets player to have any real influence, leading all scorers with 31 points in his return from injury. Arron Afflalo scored 30 points for the Nuggets as they beat the Phoenix Suns at home. Al Harrington had 23 points off the bench for Denver. Shannon Brown had 18 points to lead the Suns. Al Jefferson’s 30 point 11 rebound and 5 block game lifted the Utah Jazz over the Golden State Warriors. David Lee had 26 points and 12 rebounds in the loss. Goran Dragic had 25 points and 11 rebounds while Marcus Camby pulled down 11 rebounds as the Rockets got a big win against the Lakers, winning 112 to 107. Kobe had 28 points in the loss. Bargnani had 30 points as Toronto beat fellow cellar dweller Charlotte by 5 in Canada. DJ Augustin had 18 off the bench as Kemba Walker was given the start. Demar DeRozan had 20 for the Raptors to support Bargnani. The game was won within the first quarter as the San Antonio Spurs shot 60% percent, destroying the hapless Cavaliers by 35 points. Aussie point guard Patty Mills lead the way for the Spurs with 20 points off the bench in 20 minutes playing time. Boris Diaw had 9 assists, while kyrie Irving had 13 points and 5 assists in the horror loss. The Pacers launched a 40 point final quarter to defeat the New York Knicks despite Carmelo Anthony’s 39 points. Granger had 27 as the Pacers rolled right through and well over a final quarter deficit. LeBron James’ season high 41 points lead the Heat to a win over ‘best of the rest’ contender Philadelphia. LeBron also pulled down 6 boards and handed out 4 assists as the Sixers’ Evan Turner had 26 points. 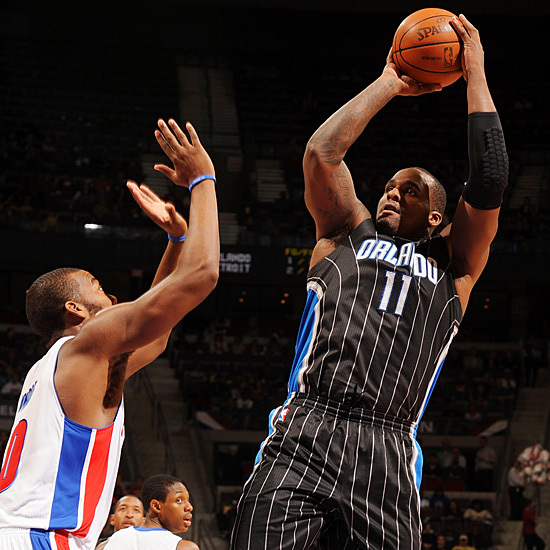 Still without Dwight Howard, the Orlando Magic went down to the Detroit Pistons, despite a big effort from Glen Davis who had 31 points and 10 rebounds whilst trying to guard budding big man Greg Monroe/ Monroe had 22 and 11 to lead the Pistons. Steve Nash had 18 and 12 assists as the Suns beat the Sacramento Kings. DeMarcus Cousins HUGE game of 41 points and 12 rebounds somehow was not enough for the Kings as the lost by 9. Kobe Bryant had 24 points and rattled home the game sealing three as the Lakers beat the Nets without Andrew Bynum. Deron Williams had 20 points and Kris Humphries had 18 and 15 rebounds in the loss.